December 5th 2014. 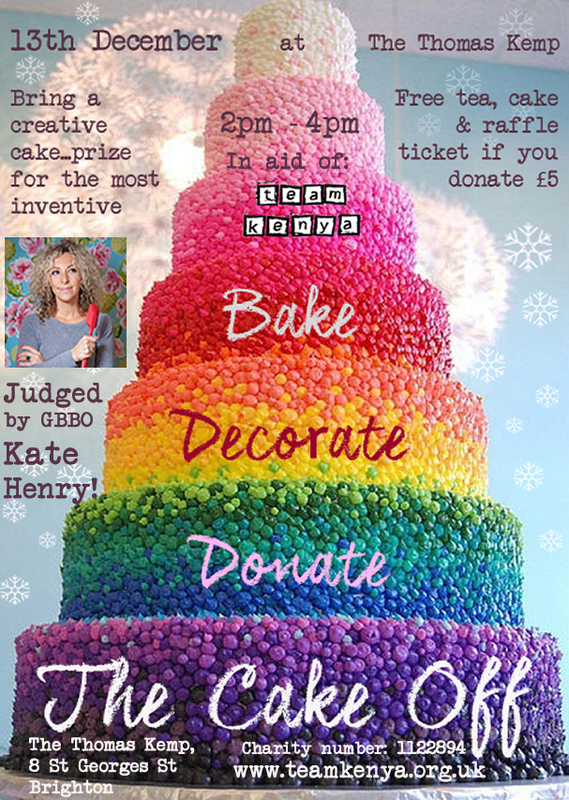 The Cake Off in Brighton takes place on Saturday, December 13th and will be judged by The Great British Bake Off’s Brightonian Kate Henry. Organised by local charity Team Kenya, funds raised at this event will go directly to helping address issues of poverty, equality and empowerment in Ndhiwa, Kenya. The winner receives afternoon tea for two at The Grand Hotel. A number of raffle prizes from other local businesses a lined up, including a food voucher from Foodilic, a jewellery stand, and a love heart to hang in your house, from Sass & Belle, a leather-bound travel journal from Sussex Travel Clinic, and certified organic whey protein from The Organic Protein Company Ltd – plus more prizes. Entry is open to anyone who fancies their chances at baking a cracking cake. All they have to do is bring it along to the Thomas Kemp pub, 8 St George’s Road, Brighton, at 2pm on December 13th by simply turning up on the day. They can register their interest beforehand with charlotte@team-kenya.co.uk if they want to. Swapping tips, tasting bakes and slurping tea with Kate, who featured in The Great British Bake Off 2014, followed by the judging, will be the order of the afternoon. So, if anybody fancies themselves as a whiz with a whisk, want to try their hand at artful icing or simply want to eat cake for charity, the two hour Cake Off is the event for them. Entry is free; however a £5 suggested donation will get entrants cake, a cuppa and a raffle ticket. Team Kenya is a small charity based in Brighton, run entirely by volunteers. It has a long standing partnership with the Luo tribe in Ndhiwa, Kenya. Every pound donated goes directly towards the people of Ndhiwa. The facts: 40 years is the average life expectancy. 63% of the community lives in extreme poverty. Maternal and child health is very poor. Malaria, typhoid & TB are widespread. Ndhiwa currently has the highest HIV/AIDS rate in Kenya. What does Team Kenya do? Team Kenya has three areas of focus: Girl and Women empowerment, Education and Entrepreneurship. Team Kenya is taking practical action that enables girls and women in Ndhiwa to fulfil their potential. It sponsors the education of students in Western Kenya to help provide a better future for themselves and their community. Entrepreneurship is one of the most effective forms of local development and addresses the root cause of poverty, says Charlotte at Team Kenya. Western Associates PR is not charging Team Kenya, The Cake Off or Kate Henry for its services.